« Building a New Trading Computer – Thoughts? I came across this article by Alan Farley (who I interviewed a while back). In the article he describes his trading desk and how he has things arranged, what subscriptions he has, etc. I’m always interested in hearing how other traders’ have things arranged – I devote a good deal of thought to my trading routine and am always looking for ways to improve it. Seriously, though, just a few stocks on a big watch list will trigger decent opportunities during a typical trading day. It’s our job to uncover these hidden gems and to avoid getting eyestrain looking at everything else. Sadly, this is a task at which most traders fail, i.e., they get so overwhelmed by randomness, there’s no brain space left for the real thing. This underscores the main purpose of your trading desk – to allow you to easily focus on the small subset of data that you can profit from. This is the opposite of a lot of new traders that try to fill up their trading desk with as much data as possible as if they’ll miss something if they don’t cram 20 indicators onto a chart. There’s an infinite amount of data out there that you could look at. Your better off ignoring everything by default and deciding what not to ignore instead of the other way around. 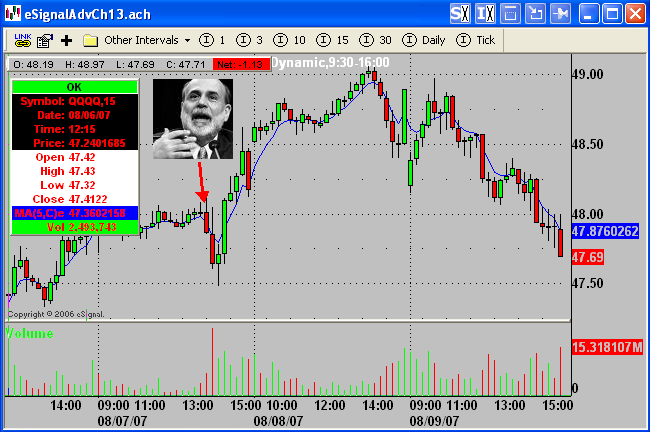 Hat tip to Trader Mike for the article link. I’ve recently started using QuoteTracker as my charting platform to see how I’d like it. So far I think it’s fantastic – every bit as good as eSignal (for most things). Here’s a great feature that’s in QuoteTracker that, after using it for a couple days, makes me think it should be in every charting platform. 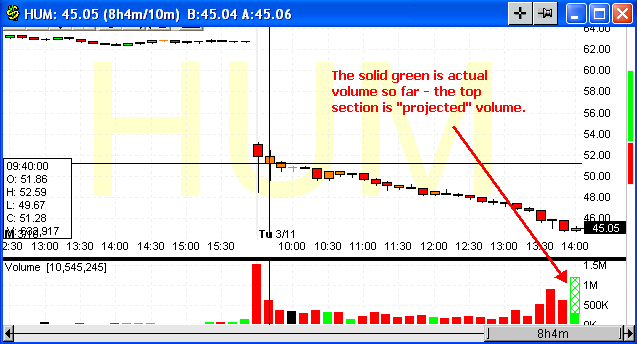 Before a candle completes, QuoteTracker displays the “projected volume” of the candle. So at the current rate of volume during the current candle it projects how large the volume bar will be when the candle completes. What a great, intuitive feature – I love it. I’m still clinging to a couple different charting platforms, which I’ll discuss in a future post. For now, though, QuoteTracker is working well. Hat tip to Eyal for turning me on to this. 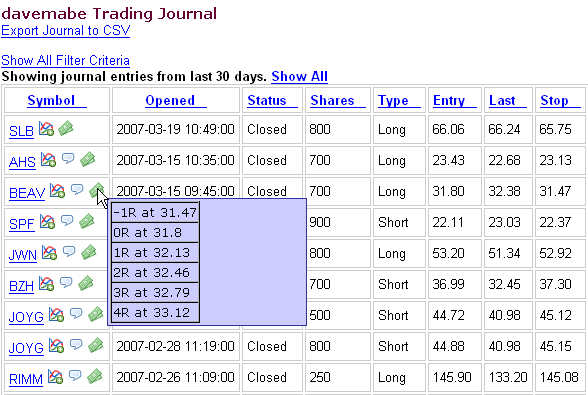 I took a couple losing trades today – small bets, but losses nonetheless. Here’s one that caused me to take some action. In the above chart, I was looking for FMCN to break 45.00, so I entered a buy stop limit order for 50.05 with the stop at 50.01. Well, as you probably know the stop price gets triggered by the ask for buy stops (bid for sell stops) and you can probably guess what happened. The ask went to 50.01 for a split second (I’m just assuming since I didn’t see it on level 2) and my order was triggered and filled at 50.00. Of course, the price soon retreated and I was stuck with something I didn’t want. This has happened to me a couple times before, but this time I decided to do something about it. I set up an alert template to execute an order when the ask reaches a certain point AND the trade price reaches a certain point. Once you save the template, you can use it for any stock and you only have to fill in the shares and price levels that you want. A huge time saver. Here’s a screenshot of the order I’ll be entering next time around. 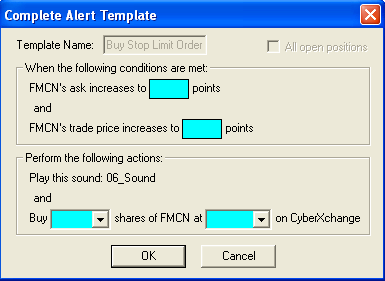 I just right click on the FMCN’s chart or level II screen or the entry for FMCN in a trading list and choose my alert template that I called “Buy Stop Limit Order”. I’m pretty sure it was Maoxian that introduced me to the Faviconizetab Firefox extension. I’ve combined that with the Permatab Firefox extension for a few select sites that I have open all the time. I’ve just added WallStreak to this group, which reminds me that I’ve been meaning to post about this. Gmail – best web based email ever. What deserves a place in your Permatab list? Speaking of WallStreak, I find myself using it more and more. It took me a while to warm up to the idea, but WallStreak is sort of a niche Jaiku for traders which I think makes sense, especially since Jaiku struggles to keep up with surging demand.